Jewelry Bishop staff - 64 - Istok Church Supplies Corp. 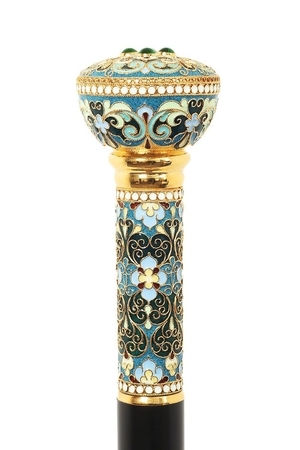 Excellent Orthodox jewelry Bishop staff. Solid wood, brass, filigree, hot enamel, gold-gilding, hand-painting. Size: 0.3''x5.9'' (7x150 mm). Yet again, we are about to send you an order with confidence that we will receive another beautiful item, whether metal or fabric. We only wish that we could afford more! Thank you for your excellence. The Vestments for St. Spiridon Cathedral arrived and they are just beautiful! Thank you so much for such wonderful work. Thank you very much for all the help and understanding information. You are a true gentlemen. Sas Efharisto. My vestment fits perfectly and looks great!